Thus their question was an expression of perplexity, which the Lord dispels by explaining, “Neither hath this man sinned, (how could he before he was born?) nor his parents.” Christ does not say simply, “His parents did not sin,” implying that they were without fault; He adds, that he was born blind. His parents did sin, but that was not the cause of his blindness. It would be unjust to charge the sins of parents to the children, who have done nothing wrong. God makes this clear through the words of the prophet Ezekiel (18:2): “Let this parable no longer be spoken, The fathers have eaten unripe grapes, and the children’s teeth shall be set on edge.” The Lord also gave this commandment, through Moses: "And the sons shall not be put to death for the fathers; everyone shall be put to death for his own sin" (Dt. 24:18). But some might object, “Yet it is written, I am the Lord thy God, a jealous God, recompensing the sins of the fathers upon the children, to the third and fourth generation" (Ex. 20:5). It must be understood that this is not a universal decree applying to all men at all times, but only to those who came out of Egypt. Also, the meaning of the decree must be considered carefully. It does not say that the children are punished for the sins of their fathers, but rather that the sins of the fathers—meaning, the punishments for their sins—will be “recompensed” upon their children. This is because the children have committed the same sins as the fathers. The Lord did not want those who came out of Egypt to think that if they committed the same or worse sins than their fathers they would not be punished. Another way to put it is: “The sins of your fathers (that is, the penalty for their sins,) will come upon you also, because you did not become better than they, but have committed the same, and even worse.” Even when you see infants taken from this life, you must understand clearly that God cut their life short out of love for man. Had they lived, they would have become worse than their parents and filled their own souls, and the souls of many others, with wickedness. But all this is hidden in the abyss of God’s judgments. Let us now continue. 3–5. Jesus answered, "Neither hath this man sinned, nor his parents: but that the works of God should be made manifest in him. I must work the works of Him that sent Me, while it is day: the night cometh, when no man can work. As long as I am in the world, I am the light of the world." Now another perplexity arises. One might ask, “How could Christ say this? Was it not unjust to deprive this man of his sight so that the works of God should be made manifest in him? Could not these works have been revealed some other way?” We would answer, “How have you been treated unjustly, O man?” “I have been robbed of light,” he replies. “But what harm did you suffer by being deprived of material light? Now you have received not only physical vision, but that incomparable blessing—the enlightenment of the eyes of your soul.” Thus the affliction was to the blind man’s benefit, and through his healing he came to know the true Sun of Righteousness. Therefore, the blind man was not wronged; he was blessed. Now, understand this as well, every student of Divine Scripture: the conjunctions ἵνα and ὅπως (both translated in English as “that”) are often used to express the outcome, but not the intended result, of the action stated in the main clause. Thus David says, "Against Thee only have I sinned, … that Thou mightest be justified in Thy words" (Ps. 50:4). The word that introduces a result unintended by David. When David sinned, he did not do so with the purpose in mind of justifying God; but his sinning did result in God being justified. David proved himself unworthy of all that God had given him: he abused his royal power, committed murder and adultery, violated divine commandments, and showed contempt for God. Taking advantage of his kingship, David spurned the laws of the One Who made him king. Had he been a commoner, he would have been unable to commit the two great sins so easily. Once the Lord had examined and decided his case, the necessary consequence of David’s crimes was that God was justified and had prevailed over the king who was condemned. There are many places in the Epistles where such expressions are used. In Romans Paul writes, “Because that which may be known of God is manifest to the Greeks, for God hath showed it unto them, making His eternal power and Godhead . . . understood by the things that are made, . . . so that they are without excuse" (Rom. 1:19-20). God did not give this knowledge to the Greeks in order to deprive them of any excuse when they sinned. He gave it to them so that they would not sin. When they did sin, their knowledge of the Creator manifest in His creation rendered them guilty without excuse. Likewise, in another place Paul says, "The law entered, that the offense might abound: (Rom. 5:20), although the law certainly was not given in order to make sin more prevalent, but just the opposite, to keep it in check. But because the recipients of the law did not want to restrain their sin, the law—defining what is a transgression—resulted in sin “abounding.” They considered their sins to be greater and more numerous because they sinned with full knowledge of the law. 6–7. When He had thus spoken, He spat on the ground, and made clay of the spittle, and He anointed the eyes of the blind man with the clay, and said unto him, "Go, wash in the pool of Siloam," (which is by interpretation, "Sent".) He went his way therefore, and washed, and came seeing. "When He had thus spoken" - Jesus did not stop with words, but at once added the deed — "He spat on the ground, and having made clay, He anointed the eyes of the blind man.' By using the clay, the Lord showed that it was He Who formed Adam out of clay. Earlier He announced, in so many words, “I am He Who formed Adam,” offending His listeners; now He demonstrates with an irrefutable deed the truth of that proclamation. Jesus created eyes for the blind man out of clay, just as He had done for Adam. He did not merely fashion the eyes, or open them, but gave them vision. This proves that it was He Who breathed the soul into Adam. Without the soul being present to impart its divine energy, even a perfectly formed eye would see nothing. Christ used spittle to make him see, because He was about to send the blind man to the pool of Siloam and wanted to make clear that He, not the water of that spring, was the source of the miracle. Let us learn that He fashioned and opened the man’s eyes by the power which proceeds from His mouth; this is why He spat on the ground to make clay. Then, lest anyone imagine that the source of the miracle was the earth, He ordered the man to wash off the clay. Some say that the clay was not removed, but was fashioned into eyes. Why does He command him to go to the pool of Siloam? First, that we may learn of the blind man’s faith and obedience. He did not reason, “If the clay and the spittle will give me eyes, why must I wash in the pool of Siloam?” Instead, he obeyed the One Who commanded. Second, with this order, the Lord confounds the Jews who wilfully rejected Him. It is likely that many saw Him anoint the man’s eyes with clay and paid close attention to what He was doing. As a result, no one could later dispute that the Lord had done these things. Third, by sending the blind man to the pool of Siloam, Christ shows that He is not an opponent of the Old Testament. And why does the Evangelist add the interpretation of the word “Siloam”? So that you might learn that the pool of Siloam is a figure of Christ, and that it was Christ Who healed the man there. Just as Christ is the spiritual Rock, so is He the spiritual Siloam. As the gush of the spring of Siloam was fearful in its strength, so too the advent of the Lord, hidden and unknown to the angels, overwhelmed all sin by its power. 8–11. The neighbours therefore, and they which before had seen him that he was blind, said, Is not this he that sat and begged? Some said, This is he: others said, He is like him: but he said, I am he. Therefore said they unto him, How were thine eyes opened? He answered and said, A man that is called Jesus made clay, and anointed mine eyes, and said unto me, Go to the pool of Siloam and wash: and I went and washed, and I received sight. Staggered by this extraordinary miracle, the neighbors still did not believe. Yet the blind man’s arriving at the Pool of Siloam, his eyes smeared with mud, was ordained by the Lord for the express purpose of drawing the attention of many onlookers, who later would be unable to deny that they knew the man. But they disbelieved nevertheless. The Evangelist does not simply remark in passing that the man was a beggar: he does so to show that the Lord’s love for mankind was so inexpressibly great that He condescended to help the most abject of men. With tender solicitude He healed beggars, teaching us to care for the least of our brethren. Unashamed of his former affliction, unafraid of the crowd, the blind man boldly confesses, "I am he," and proclaims his benefactor: "A man that is called Jesus…." He calls the Lord a man because he knows nothing about Him. But what he does know (of the circumstances of the healing), he confesses to all. How did he know that his healer was Jesus? He had heard the Lord conversing with His disciples. When the disciples asked about the blind man, Christ repeated what He often told them, such as, "I must work the works of Him that sent Me" (v. 4), and, "I am the light of the world" (v. 5), and so forth. These were things that no one except the Lord taught, and from them the blind man understood that this was Jesus. That Christ had made clay and anointed his eyes, the blind man knew by feeling; of the spittle, he said nothing because he did not yet know about it. What he did not know, he did not mention, so truthful a man was he. 12–16. Then said they unto him, "Where is He?" He said, "I know not." They brought to the Pharisees him that aforetime was blind. And it was the Sabbath day when Jesus made the clay, and opened his eyes. Then again the Pharisees also asked him how he had received his sight. He said unto them, "He put clay upon mine eyes, and I washed, and do see." Therefore said some of the Pharisees, "This man is not of God, because he keepeth not the Sabbath day." Others said, "How can a man that is a sinner do such miracles?" And there was a division among them. After the Lord had healed or worked some other miracle, He would withdraw from that place to avoid ostentation. This is why the Jews ask the blind man, "Where is He?" He answers, "I know not," for he is always truthful. They brought him to the Pharisees for closer and harsher questioning. The Evangelist emphasizes that it was the Sabbath day in order to reveal their evil intent as they grasp for allegations to make against Christ. By accusing the Lord of breaking the Sabbath, they hoped to divert attention from the miracle. They demand, “How did He open your eyes?” rather than simply asking, “How did you receive your sight?” compelling the blind man to admit that Jesus had made clay on the Sabbath. For they continuously accused the Lord of violating the Sabbath. But because he had already given this information to the people who were listening to him, he does not mention Jesus’ name, nor what the Lord said to him. He explains merely, He put clay upon mine eyes, and I washed, and do see. It is likely that the people who brought the blind man had slandered the Lord by telling the Pharisees, “Look what Jesus is doing on the Sabbath.” Note the blind man’s boldness when speaking with the Pharisees. The Jews brought him to the Pharisees so that he would become frightened and deny the healing. But he cries out, “I do see!” Therefore said some of the Pharisees, not all of them, but the most insolent, "This man is not of God." But others said, "How can a man that is a sinner do such miracles?" Behold how the attitude of many of them softens as a result of the miracles. They are Pharisees and rulers, yet they begin to be won over by this sign, and to take Christ’s side, so that there was "a division among them." The division appeared earlier in the crowd, when some of the people said, "He deceiveth the people," while others said, "He is a good man" (see Jn. 7:12, 43).” But now the division arises between the rulers, and many Pharisees take issue with their fellows and speak in Christ’s defense. Although they took His side, they did so weakly, and without conviction. Hear what they say: “How can a man that is a sinner do such things?” See how feeble is their resistance, how cunning His accusers! Rather than say, “This man is not of God, because He heals on the Sabbath,” the crafty Pharisees object, "He keepeth not the Sabbath day." Not once do they mention the good deed, but only the violation of the Sabbath. Note this as well: the rulers are more reluctant than the people to admit the good Christ did. From the start a difference of opinion is evident among the common folk, with many supporting Christ. Only later did this praiseworthy division appear among the rulers. I call it “praiseworthy,” because there are good separations and justifiable schisms. The Lord says, “I came to send a sword on the earth" (see Mt. 10:34). The "sword" means the salutary divergence of opinion that may arise when true reverence for God is at stake. 17–19. They say unto the blind man again, "What sayest thou of Him, that He hath opened thine eyes?" He said, "He is a prophet." But the Jews did not believe concerning him, that he had been blind, and received his sight, until they called the parents of him that had received his sight. And they asked them, saying, "Is this your son, who ye say was born blind? How then doth he now see?" 20–23. His parents answered them and said, "We know that this is our son, and that he was born blind. But by what means he now seeth, we know not; or who hath opened his eyes, we know not: he is of age; ask him: he shall speak for himself." These words spake his parents, because they feared the Jews: for the Jews had agreed already, that if any man did confess that He was Christ, he should be put out of the synagogue. Therefore said his parents, "He is of age; ask him." The Pharisees had put three questions to the parents of the blind man: “Is he your son? Was he born blind? And how did he gain his sight?” To the first two they assert: “He is our son, and he was born blind.” Concerning how he was healed they are silent, because they do not know. Without doubt this took place for the greater confirmation of the truth; for the man who received the benefit of the miracle, and was the most credible of all the witnesses, said exactly the same. Then the parents add, “He is of age; he is not an infant, or so immature as not to understand how he was healed.” "These words spake his parents, because they feared the Jews." They were still weak in faith and more faint-hearted than their son, who proved to be a steadfast witness to the truth. As a reward, God also illumined the eyes of his mind. 24–29. Then again called they the man that was blind, and said unto him, "Give God the glory: we know that this man is a sinner." He answered and said, "Whether He be a sinner or no, I know not: one thing I know, that, whereas I was blind, now I see." Then said they to him again, "What did He to thee?" How opened He thine eyes?" He answered them, "I have told you already, and ye did not hear: wherefore would ye hear it again? Will ye also be His disciples?" Then they reviled him, and said, "Thou art His disciple; but we are Moses’ disciples. We know that God spake unto Moses: as for this fellow, we know not from whence He is." At the parents’ suggestion, the insolent Pharisees had the blind man brought to them again, not for further questioning, but to intimidate him into denying his Healer. Their words, "Give God the glory," mean, “Confess that Jesus did nothing to you — by not attributing anything good to Jesus, you give glory to God.” "We know," they say, "that this man is a sinner." Why, then, O Pharisees, did you not accuse Him when He challenged you, "Which of you convinceth Me of sin" (Jn. 8:46)? But the blind man answers them, Whether he be a sinner or no, I know not; that is, “It is not mine to decide this now, nor even to consider it. Of one thing I am certain: He did work a miracle for me. Ponder this single fact, and it will dispel your perplexity.” By asking him again, "What did He to thee?" 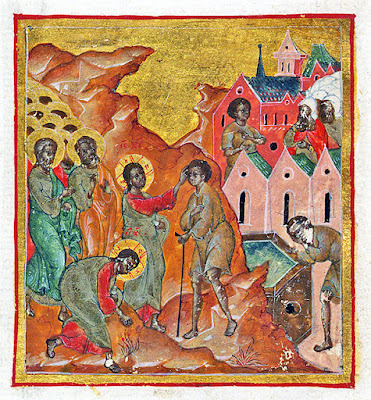 they attack the Saviour for anointing with clay on the Sabbath. The blind man understood that they were not interested in his answer, but only wanted to revile Jesus, and so he rebuked them, saying: “I no longer wish to speak with you. I answered you many times and ye did not hear.” Then he added these words, which cut them to the quick: "Will ye also be His disciples?" By this he lets it be known that he wants to become Christ’s disciple. Teasing and jesting with them, he speaks calmly, not in the least cowed by their rage. They answer with insult, "Thou art His disciple; but we are Moses’ disciples." Again they lie. Had they been Moses’ disciples, they would also have been Christ’s, as the Lord told them: "Had ye believed in Moses, ye would have believed Me" (Jn. 5:46). They did not say, “We have heard,” but, we know that God spake unto Moses. It was their forebears who told them this, yet they claim to have certain knowledge of what they had learned only by hearing. When, however, they see with their own eyes Christ working miracles, and hear Him speaking divine words from heaven, they called Him an imposter (see Jn. 7:12). Do you see how malice leads to madness? 30–33. The man answered and said unto them, "Why herein is a marvellous thing, that ye know not from whence He is, and yet He hath opened mine eyes. Now we know that God heareth not sinners: but if any man be a worshipper of God, and doeth His will, him He heareth. Since the world began was it not heard that any man opened the eyes of one that was born blind. If this man were not of God, He could do nothing." “You Jews reject the One Who healed me,” he says, “ because you know not from whence He is. But the very fact that He is not among those you deem illustrious makes it even more remarkable that He can do such things. Clearly, He has some greater power and needs no help from man.” Then the blind man answers those who had said earlier, "How can a man that is a sinner do such miracles" (v. 16)? turning their own words against them: “We all know,” he says, “that God heareth not sinners: but if any man be a worshipper of God, and doeth His will, him He heareth.” Note that he not only declares the Lord to be free of sin, but indicates that He is highly pleasing to God and that all that He does is of God, by saying, "If any man be a worshipper of God, and doeth His will, him He heareth." Knowing well that the Pharisees were intent on covering up the miracle, the blind man, with full understanding, proclaims the beneficent deed: “If He were not of God, He could not have worked such a miracle, unlike any other since the world began.” Others had opened the eyes of those who had lost their sight because of disease, but never of someone blind from birth. What occurred here is without precedent. Clearly, the worker of this miracle has greater power than any man. Some, applying cold and formal logic, have expressed this doubt: “How can the blind man say that God heareth not sinners? As the Lover of man, God most certainly hears those who pray that their sins be forgiven.” It is unnecessary to respond to this, except to point out that the words, "God heareth not sinners," mean that God does not grant sinners the power to work miracles; for the Spirit of God does not dwell in a body that is subject unto sin (Wis. 1:4). But God does hear the prayers of those who with heartfelt repentance ask forgiveness of their sins; but He hears them as penitents, not as sinners. As soon as they ask forgiveness, they move from the rank of sinners to that of penitents. It is, therefore, certainly true that God heareth not sinners; neither does He give to sinners the grace to work miracles. When unrepentant sinners ask Him for this power, they are grasping for something that does not belong to them. How could God heed those whom He rejects? Consider how the blind man said, "If any man be a worshipper of God," then added, "and doeth His will." Many are God-fearing, but fail to do the will of God. One must fear God and do His will. Both faith and works are necessary; or, as Paul says, faith and a good conscience (see I Tim. 1:5); or, to express it in the most exalted terms, divine vision and active virtue (θεωρία καὶ πράξις). Faith truly comes alive only when accompanied by God-pleasing deeds. These foster a good conscience, just as wicked deeds an evil conscience. Likewise, works are enlivened by faith. Apart from one another, both are dead. As it is written in another place, "Faith without works is dead" (Jam. 2:20)—and so are works without faith. Behold how truth bestows on a beggar, unused to public debate, the power to confess Christ boldly and to rebuke the high and mighty among the Jews! Great is the power of truth; so restricted and feeble is falsehood. 34–38. They answered and said unto him, "Thou wast altogether born in sins, and dost thou teach us?" And they cast him out. Jesus heard that they had cast him out; and when He had found him, He said unto him, "Dost thou believe in the Son of God?" He answered and said, "Who is He, Lord, that I might believe in Him?" And Jesus said unto him, "Thou hast both seen Him, and it is He that talketh with thee." And he said, "Lord, I believe." And he worshipped Him. As long as they still had hope the blind man would say something of use to them, the Pharisees called on him and questioned him more than once. But when they realized by his answers that he did not think as they did, but took the side of truth, they despised and rejected him as one born in sins. Quite foolishly do they refer to his blindness, thinking that he had been condemned before he was born and was punished with blindness at birth. This is nonsense. These sons of falsehood expelled from the temple the confessor of truth, but it was to his benefit. Cast out of the temple, he was at once found by the master of the temple. Apparently dishonored for Christ’s sake, he was honored by the knowledge of the Son of God. Jesus found him, the Evangelist says, implying that He had come for just this purpose — to console the blind man, as the judge of a contest consoles an athlete after the agony of his exertion by placing on his head the crown of victory. The Lord inquires, "Dost thou believe in the Son of God?" Why does He ask this? After such a vigorous dispute with the Pharisees, after the bold words he had spoken, can there be any doubt that he believes? The Lord asks the question, not because He is uncertain whether the man believes, but in order to reveal Himself to him. For the blind man had never seen Christ, even after his healing. How could he have, when he was straightway harried by the Jews, as if by vicious dogs? The Lord asks this question now, so that the blind man’s response — “And who is He, this Son of God?”—would provide the opportune moment to reveal Himself. At the same time the Lord shows that He highly honors the faith of the blind man. “The people reviled Me greatly, but their words mean nothing to Me,” He says. “One thing matters, that you believe.” The blind man’s question, “Who is He, Lord, this Son of God?” reveals his ardent desire. The Lord answered, Thou hast both seen Him, and it is He that talketh with thee. He does not say, “It is I Who healed you and said to you, ‘Go, wash.’” He begins enigmatically, "Thou hast … seen Him;" then He continues more openly, and "it is He that talketh with thee." The Lord first said to him, "Thou … hast seen Him," to remind the blind man of the healing and to help him recognize that he had received his sight from the One Who now stood before him. And the blind man at once believes, showing his fervent and true faith by falling prostrate before Him, thus confirming his own word by his deed and giving glory to Jesus as God. For according to the law, worship must be rendered to God alone (see Dt. 6:13). Understand also the spiritual meaning of this miracle. Every man is blind from birth, as a result of being brought into existence by coition, and being yoked thereby to corruption. From the moment we were punished with mortality and our race was condemned to increase by a passionate means of conception, a thick cloud covered our noetic eyes, like a cloak of flesh, as the Scriptures say (see Gen. 1:21). The Gentiles are “blind from birth” in another sense: they made gods of what is subject to birth and corruption, and consequently were blinded, as Paul says, "and their foolish heart was darkened" (Rom. 1:21). Just as blind were the Persian magi, who wasted their lives with horoscopes and astrological predictions. The blind man whom Jesus saw (Jn. 9:1) therefore represents all men, and the Gentiles in particular. He was unable to see his Creator, so God Himself, "the Dayspring from on high, through His tender mercy visited him" (Lk. 1:28). How did Jesus “see the blind man”? As He "passed by" (Jn. 9:1), which means, not while the Lord was in heaven, but when He came among us by His Incarnation. Humbling Himself and accepting limitation, He bent down from heaven, as the Prophet David says, to see all the sons of men (see Ps. 13:3; 32:13). Although He came, first and foremost, to the lost sheep of the sons of Israel (Mt. 10:5-6; 15:24), He also “passed by” and saw the Gentiles; for the secondary purpose of His coming was to visit the people which sat in the darkness (Mt. 4:16) of complete ignorance. And how does He heal their blindness? By spitting on the ground and making clay. If it helps you to believe, consider how God the Word descended upon the holy Virgin like a rain-drop falling upon the ground (see Ps. 71:6), and anointed the eyes of the mind with clay made from spittle and the earth. This clay is the one Christ in two natures—the divine nature, symbolized by the rain-drop and the spittle, and the human nature, symbolized by the earth from which came the body of the Lord. Do men receive healing merely by believing? Certainly not: they must first go to Siloam, which is the spring of Baptism, to be baptized into Him Who sends them there, namely, Christ. "For as many of us as have been baptized spiritually have been baptized into Christ" (Gal. 3:27). After a man has been baptized, temptations will beset him. "He shall be brought before governors and kings" (Mt. 10:18), as it were, because of his allegiance to Christ Who healed him. He must then hold steadfastly to his confession, never denying it out of fear, but willing to be denounced and excommunicated, as it is written, "Ye shall be hated by all nations for My name’s sake" (Mt. 24:9), and, "They shall put you out of the synagogues" (Jn. 16:12). Even if this confessor is cast out by men who hate the truth, and driven from their temples and the places of honor, (meaning, he is deprived of wealth and glory,) Jesus will find him. Then he who was abused by his enemies will be highly honored by Christ. The Lord will bestow upon him knowledge and a more exact faith, and the confessor will fall prostrate and worship Christ, Who appears as a man but is also the Son of God. For there are not two sons—one, the Son of God, and another, the son of Mary (this is the blasphemous doctrine of Nestorius)—but one and the same Son, of both God and man. See how the Lord answered the blind man when he asked, “Who is the Son of God, that I might believe in Him?” "Thou hast both seen Him," Christ says, and "it is He that talketh with thee." Who gave this answer? Was it not the Son born of Mary? But this Son of Mary is also the Son of God, not two different persons. Therefore the holy Mary is truly the Theotokos, the Birthgiver of God, who bore the Son of God made flesh. He is undivided, and the two are One — Christ the Lord. 39–41. And Jesus said, "For judgment I am come into this world, that they which see not might see; and that they which see might become blind." And some of the Pharisees which were with Him heard these words, and said unto Him, "Are we blind also?" Jesus said unto them, "If ye were blind, ye should have no sin; but now ye say, 'We see;' therefore your sin remaineth."